18 Adams Road, Yarrawonga NT 0830. Opening Hours: 8am to 5pm Monday to Friday. 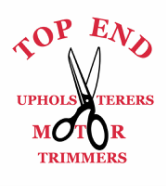 From small repairs and restitches to full custom retrims, trust Top End Upholsterers to get the job done. Locally owned and operated in the NT for over 20 years we endeavour to provide quality products and a high standard of service. Located in the Yarrawonga Industrial area in the City of Palmerston, we do free quotes for all areas from Darwin to Rural Areas. We are registered with the NT Govt Home Improvement Scheme, please contact us for more information.